Kuta Beach in Bali is not only to wait for the sunset. In this beach purse can learn surfing. Waves on Kuta beach is not so great, so it was not too dangerous for anyone, and is suitable for beginners who want to learn surfing. Just need a bit of courage to try, then we will be able to surf on the waves of the sea water. In Kuta beach, there are plenty of rental surfboards water, and there is also a crash course in surfing, that we can try. For the cost, simply by Rp. 150 000, we will education was given by experienced surf guides. We will be invited to learn to conquer the waves until we can surf alone. 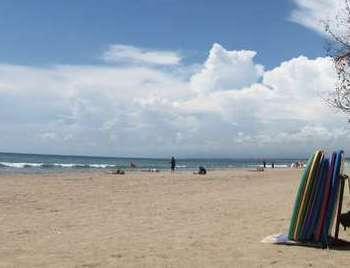 Regarding security, on Kuta beach safety is guaranteed. If we've learned studying surfing satisfied, we can rest while waiting for the sunset at Kuta beach. The beauty of the sunset at Kuta beach is well known to foreign tourists. While buying snacks that can be purchased in stores nearby, we would be satisfied to enjoy Kuta beach in Bali.